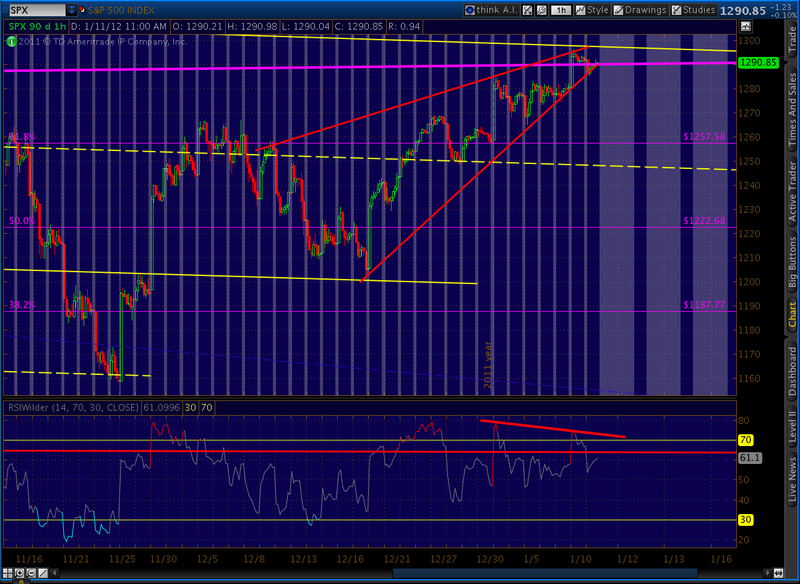 We have a nearly completed Bat pattern on the Dow. Counting from the May 2 high, the .886 is at 12,594. But, the same pattern drawn from the July 7 high is complete. We reached the .886 of 12,486 yesterday. Either looks complete from the standpoint of the channel lines and the trend line running through the topping pattern — the intra-pattern third rail. 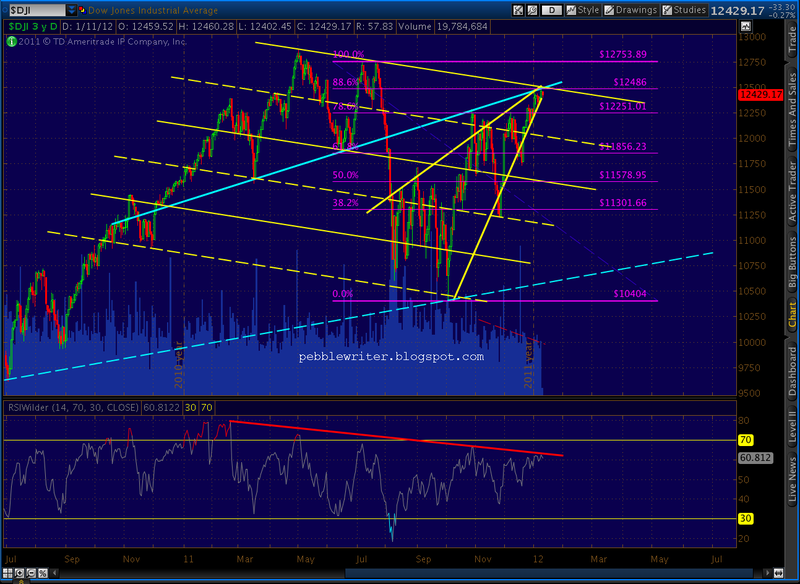 We also have a clear touch of the RSI trend line from Feb 2011, the start of the topping pattern. The segment from the October highs represents obvious negative divergence. Unlike the S&P; 500, the trend line connecting the May 2 high with the July highs leads us to right here, right now. On the Dow, Minor 2 looks very, very done. The SPX, on the other hand, touched its .786 Fibonacci retracement — for the second time — yesterday. That’s from the July 7 high, BTW. The .786 off the May 2 1370 high is 1307. 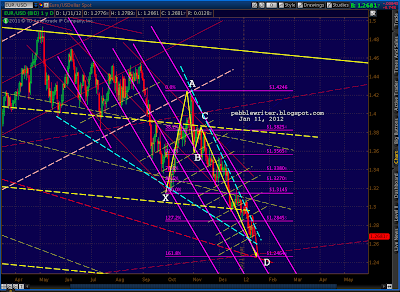 Neither really works as a completed Harmonic pattern. Like the DJIA, Point C is lower than Point A — in this case, much lower. Not good form. And, the only pattern that completes at a .786 is a Gartley, which requires a Point B at the .618 (the Aug 31 high of 1230 came within 18 points.) So, again, not really well formed. All that being said, should we care? A .786 retracement is one of the most common corrective wave targets. The trend line connecting the Feb and July tops is pretty well in place (though not quite a perfect fit). The trend line (the third rail) running through the pattern has clearly been connected. And, the RSI trend line just got tagged — with negative divergence since late Oct.
Taken separately, they’re a bunch of interesting little indicators that catch your eye. Together, they form a beautifully laid out mosaic of a Minor 2 top. 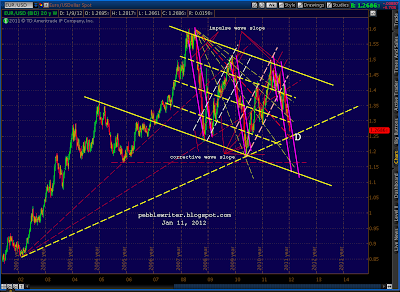 The steps on which EURUSD pauses before each push down are getting shorter and shorter. Two steps ago, we didn’t even get a right shoulder to the H&S; pattern. This last step hasn’t even bothered with a head — just a left shoulder and done. One way of looking at it is that we’re getting that much closer to the floor dropping out from underneath, a rifle shot to the next lower channel as happened in each of the previous two major channels. Another interpretation is that we’re tracing out a falling wedge — which necessarily gets narrower as we approach the apex. The two options lead to quite different outcomes for the Euro and the equity markets. 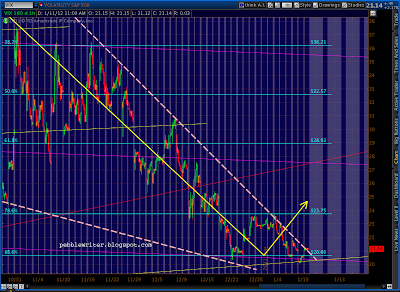 We are approaching the end of the Crab pattern I’ve been watching for the past two months. 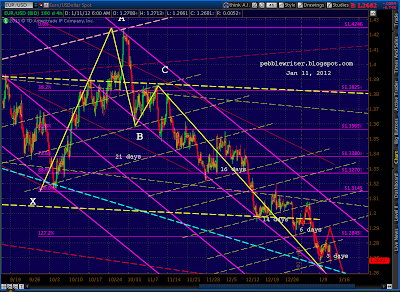 Its 1.618 extension is just below at 1.2464. The problem for EUR bears is that 1.2464 also marks the crossing of an important fan line, highlighted in the chart below as the yellow dashed line rising from 2002. This will be the first test of this particular line, but in tests of previous fan lines we saw bounces ranging from barely noticeable to .08. The fact that this one coincides with a Crab completion makes me think it could be significant. 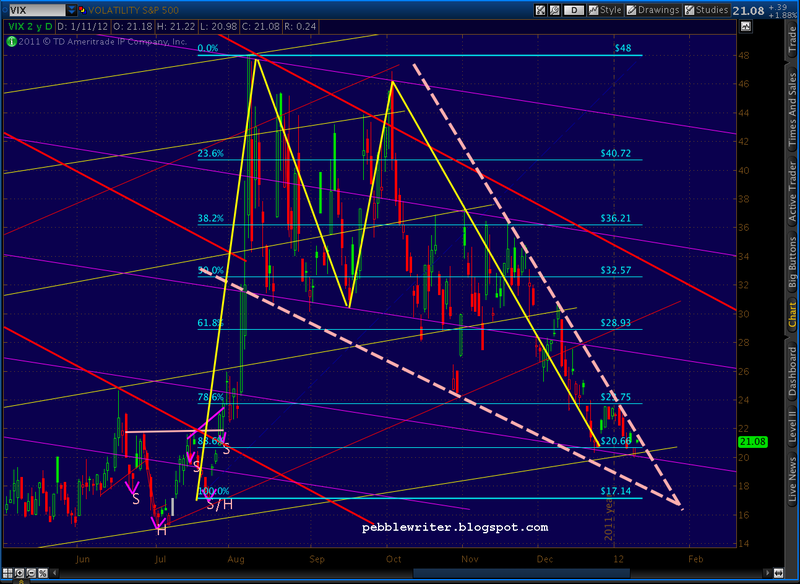 Also, there are several other harmonic patterns to consider. The one starting in June 2010, featuring May 2011 as the Point A, has a .786 Fib level just up ahead at 1.2531. The Point B didn’t quite reach the .618, so there’s a very good chance it’ll register as a Crab (with a .9983 target!) 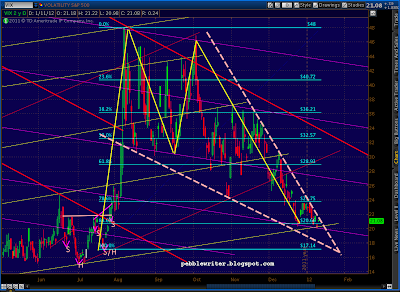 instead of Gartley, but the .786 should be good for a bounce all the same. And, last time I checked, there were a slew of short spec positions on the EURUSD; so, a hard bounce could have some legs as short covering commences. 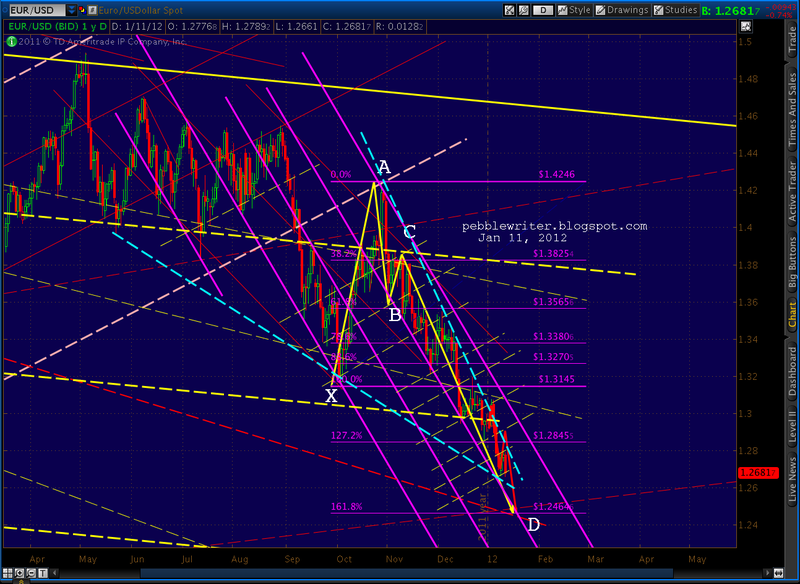 It probably couldn’t break out of the major channel (purple, solid). 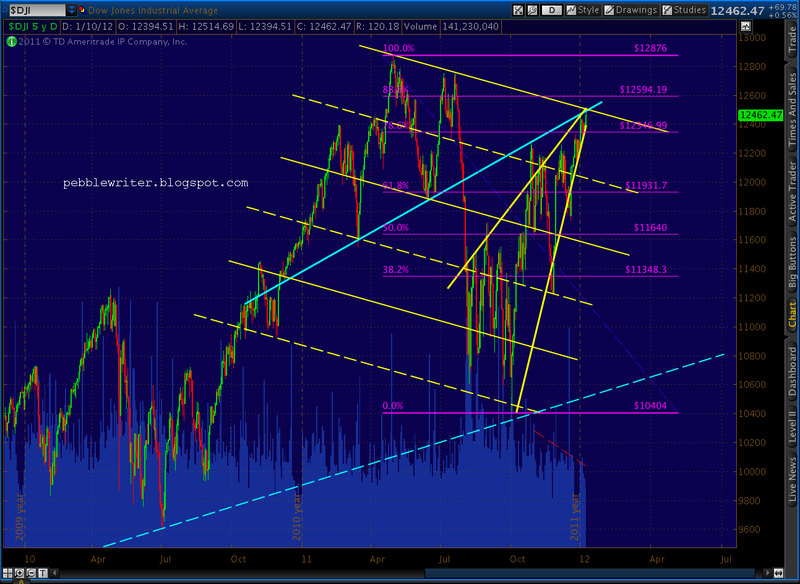 But, it might try for 1.30 in a backtest of a channel line (yellow, dashed) and a fan line down from the Jul 08 highs. But, currency traders are very savvy at harmonics, so most of these targets are well-known; the surprise element might well be muted. 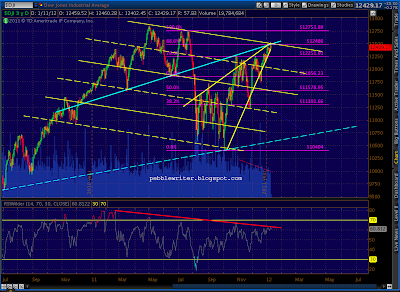 And, I’m not sure how much of an impact a bounce will have on equities. I realize that sounds a little heretical, but hear me out. The last major move up by EURUSD was from 1.1876 to 1.4939 over the time span of Jun 7, 2010 to May 4, 2011 — a stunning 25.8% rise. During that same time, SPX rose from 1050 to 1347, a similarly spectacular 28.3% increase. We were thus conditioned to see them as moving in lock step. Since May 4, however, EURUSD has fallen from 1.4939 to 1.2685 — a 15.1% slump. 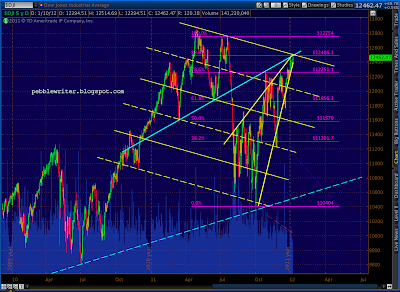 It represents a 73.6% retracement of the previous rise. 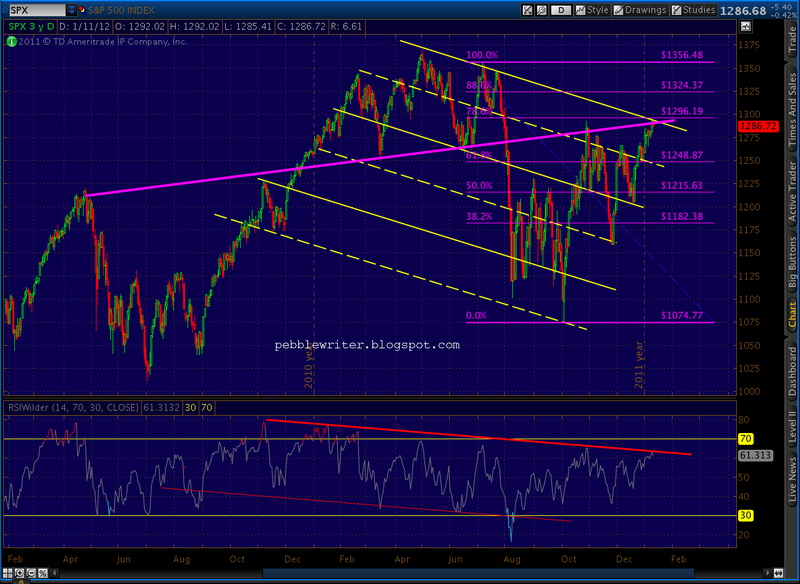 SPX, on the other hand, has fallen a mere 58 points from 1347 to 1289. 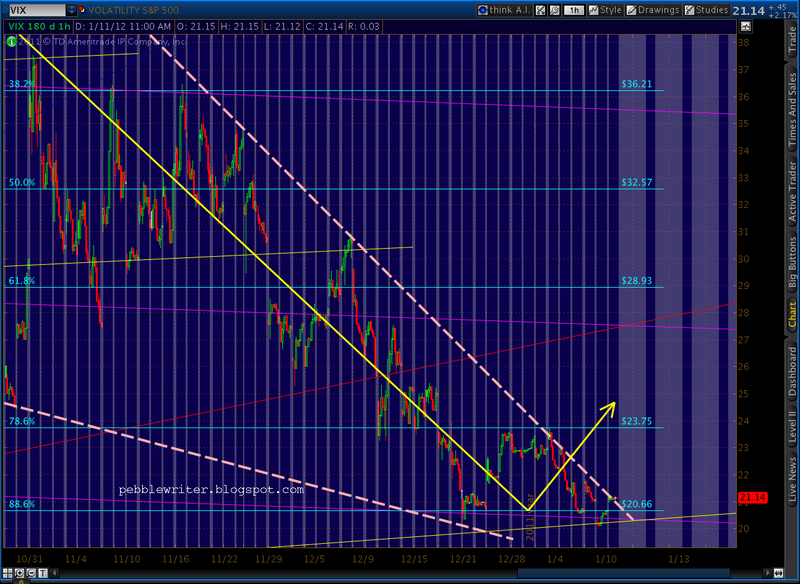 That’s only a 4.3% drop for a 19.5% retrace. Clearly, the step ain’t so locked anymore. Those who, like me, are of a bearish persuasion, will see this as a negative divergence that will soon be rectified when SPX catches up on the downside. 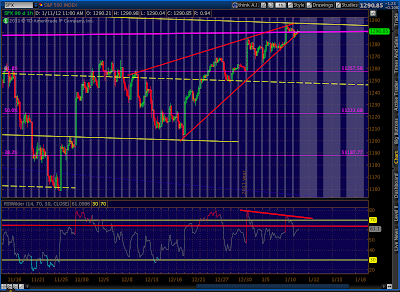 A 15.3% drop from 1347 would be 1143. 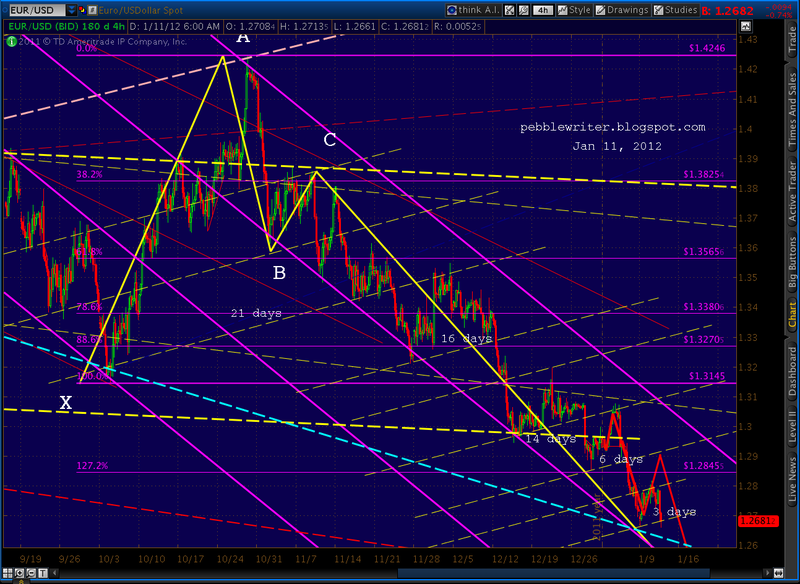 A 73.6% retrace would target 1128. We could see DX at 82 if the 10-year auction comes in around 1.90%. 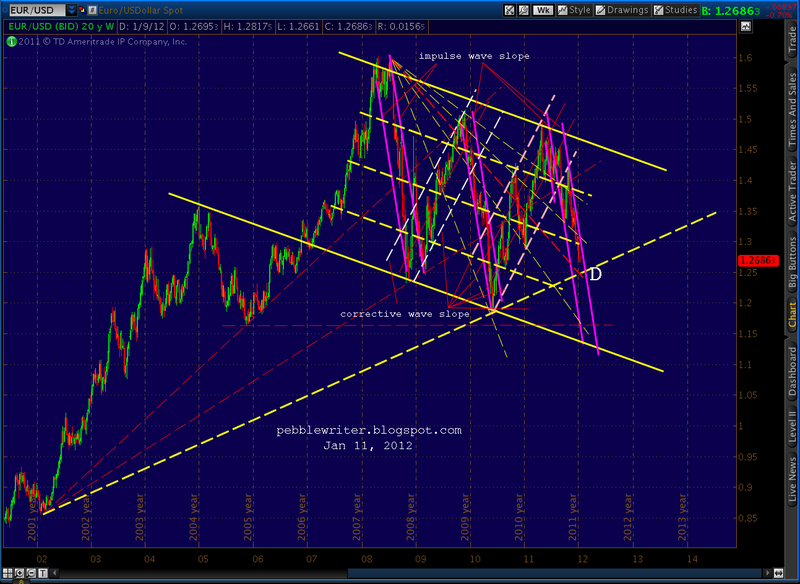 Last, remember we’re talking about the Euro’s health vis-a-vis the USD. If you subscribe to the “least dirty shirt” theory, you’ll see the dollar’s relative strength as a temporary flight to quality that benefits from a lack of good alternatives. Clearly, the USD has its own issues. One of these days, the ravenous wolves will notice the other fatted currency barely outrunning its weaker sibling. CM: XLF pushed to it's .886 yesterday. I'll put up some fresh charts shortly. Masked: Happy to oblige. Check this morning's new post. By any chance do you happen to have any charts on the nasdaq. Whether they're old or updated would be awesome. Thank you much in advance. XLF has been unusually strong these past days. in fact it has surpassed the 13.65 target. Do you think the market will turn while financials so strong? Which one is goin lead the way down?